Each year in Georgia, thousands of people are killed or injured in traffic accidents. These crashes cost Georgians millions of dollars. Many law enforcement agencies have created specialized units to investigate serious traffic accidents, and, at the same time, prosecutors have demanded that great emphasis be placed on forensic examinations of collision elements so that serious violators of Georgia’s traffic laws be subject to prosecution and victims receive justice. Serious accidents require a thorough investigation to determine fault for prosecutorial purposes. 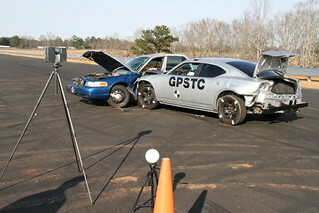 In order to meet this challenge and reduce fatalities on Georgia roadways, GPSTC offers a Traffic Accident Reconstruction Specialist Certification training program. This program thoroughly prepares students to investigate serious traffic accidents, and gives state recognition to officers who have demonstrated a high level of competency and commitment in the field of traffic accident reconstruction. Completion of the Traffic Accident Reconstruction Specialist program makes officers eligible for testing, which leads to certification as a traffic accident reconstruction specialist through the Georgia Peace Officer Standards and Training Council (POST). After a minimum of 12 months from the time the student has finished the required training, candidates will be able to make application to the Georgia Police Academy to take the final certification exam. Applications must include copies of the training certificates earned for all of the required courses. The exam will consist of a cognitive test and practical test that will measure the applicant’s level of competence in each topic area. Applicants must attain a final score of 80% on both the cognitive and performance test for each topic area to receive certification. Applicants who fail any portion of the exam may retake it once during that calendar year.